I was on the track team in High School and College. Somewhere, along the way I recognized that the dedication, time, and energy I gave to track was a skill that was transferable to other areas of my life. I joined the track team because I thought I could run (that was a fallacy! ); I stayed with it because I wanted to improve. Coaches seemed mean and harsh (back then) but they just wanted us to perform at our best - so we had some tough workouts. For example, here's a typical distance workout: 1 mile warm up, 5*800 (under 3 mins) and then a 1 mile cool down. I came home many nights in HS exhausted, but I refused to let my class work suffer. In college, we worked out at 7:00 am; I started many a day tired - but again I refused to let my class work or anything else suffer. You know what - I got better! And I was proud of myself for putting in the hard work and seeing the results. I say the above to encourage you to approach your spiritual life with the same discipline - you'll be better for it. Proverbs 4 reiterates the point of wisdom being so important we should get it at any cost. One of my favorite verses from this chapter is verse 7 which says - Wisdom is the principal thing, therefore, get wisdom; and with all thy getting, get understanding. The simplest explanation that I can give for wisdom is this: wisdom is the application of knowledge in all areas of your life. The best wisdom is gained through reading God's word. The basis of true wisdom is God's word. One of my favorite sites provides a good explanation of wisdom. 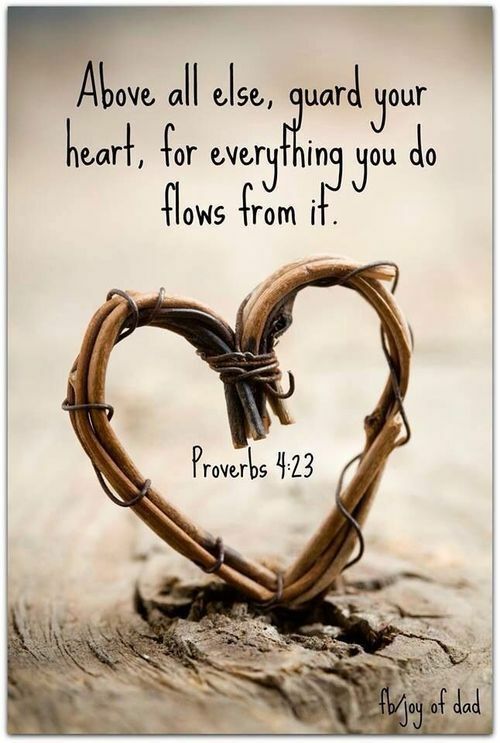 Protect your heart, for everything you do, flows from it. Watch what you say; keep your mouth free of perversity. Think about the direction you wish to go in; be steadfast. The Bible is so relevant to the world we live in. I hope you're beginning to see that as you read.